In June 1998, The Heimlich Institute became a member of Deaconess Associations Inc., to help advance and promote the mission and vision of The Heimlich Institute in perpetuity. Since then, per the ABC News story below, the mission/vision have fallen on hard times. For years the so-called institute has been nothing more than a web site used to promote my father's potentially lethal crackpot medical claims: the use of the Heimlich maneuver for near-drowning victims, to stop asthma attacks, and to treat cystic fibrosis patients - and to "cure" AIDS by infecting patients with malaria. Deaconess is a medical services corporation that claims to "enhance the well-being of our patients and communities where DAI has a presence." As Deaconess Hospital failed, the man controlling it, Anthony Woods, did well. Woods, chairman and CEO of the hospital’s parent organization, the nonprofit Deaconess Associations Inc., had total pay of nearly $3 million in 2008, according to a tax filing. 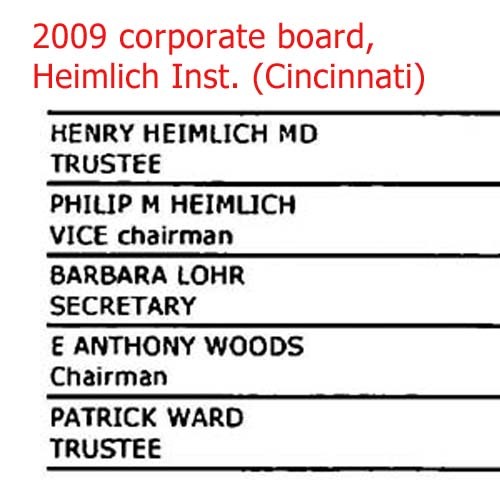 By the way, Woods is responsible for bringing the Heimlich Institute into the Deaconess fold in 1998 and is now the HI's Chairman of the Board. Much of the responsibility for the organization's activities clearly rests on his shoulders. In practice for over 18 years, Dr. Heimlich deals with patients with nearly every type of illness and chronic pain disorder. His areas of interest include low back pain due to herniated discs, neck pain due to herniated discs, spinal stenosis, carpal tunnel syndrome, migraine headaches, fibromyalgia, chronic fatigue syndrome, insomnia/sleep disorders, vertigo/dizziness/balance disorders, restless leg syndrome, IBS also known as irritable bowel syndrome, auto-immune diseases, Rheumatoid Arthritis, Alzheimer’s, Parkinson’s, gastrointestinal issues, cardiovascular wellness, diabetes, peripheral neuropathy, developmental learning disorders from ADHD and ADD to Dyslexia, Asperger’s, PDD/NOS, and Autism.